My sister-in-law, Laurel, had her photo in the Leader-Post today on the front page of the City section. The caption says, "Laurel Stang hangs a flag in Wascana Centre Sunday as part of the Community Action on Aids project." 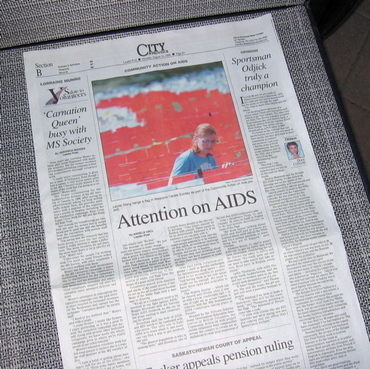 Here's a link to the article: Attention on AIDS. Laurel is a Public Health Nurse at the STD Clinic in Regina. She's a very special person to do the type of work she does and to deal with the situations she encounters on a daily basis. No doubt about it.